Terminal operator Indonesia Kendaraan Terminal (better known as IPC Car Terminal) plans to conduct an initial public offering (IPO) on the Indonesia Stock Exchange in mid-July 2018. The company, which is owned by state-owned port operator Pelindo II, handles the movement of cargo containers for shipments related to the automotive industry at its terminal in Jakarta's Tanjung Priok harbor. Chiefy Adi Kusmargono, President Director of IPC Car Terminal, said his company is the only dedicated car terminal operator in Indonesia. It is the third-largest in Southeast Asia and the 27th-largest in the world. Due to the terminal's focus on automotive cargo handling, its infrastructure is much better suited for automotive imports/exports than other terminals (conventional terminals) that not focus on automotive cargo but handle all sorts of products. In order to grow, IPC Car Terminal plans to sell a 30 percent stake to a strategic partner, for example an automotive company, logistics company, shipping services company, or an investment firm. IPC Car Terminal has three business lines: (1) terminal handling, (2) value-added services, (3) Roll-on/roll-off (ro-ro) services. However, the first line is by far, the biggest as it contributes around 97 percent to the company's total revenue. Regarding terminal handling, most revenue is generated from the "international part" (around 92 percent of the total). Differences in price and volume are reason why the international part brings in more money than the domestic one. Next year IPC Car Terminal will aim to boost earnings that stem from the "domestic part" of its terminal by attracting customers that are currently still using conventional terminals. 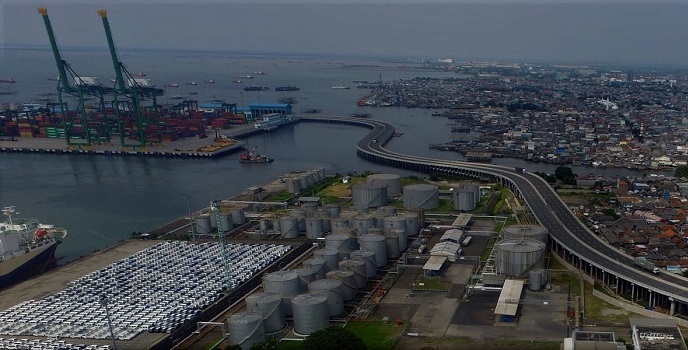 IPC Car Terminal currently operates a 31-hectare terminal in Tanjung Priok. After the IPO (within a five-year period) it wants to extend the size to 89 hectares. This should also result in expanding cargo-handling capacity from 700,000 units to 2.5 million units per year. In full-year 2017 IPC Car Terminal's revenue rose 34 percent year-on-year (y/y) to IDR 422.1 billion (approx. USD $30.6 million), while the company's net profit grew 32 percent (y/y) to IDR 130.1 billion (approx. USD $9.4 million). So far in 2018 seven companies were added to the Indonesia Stock Exchange: telecommunication construction services company LCK Global Kedaton, coal miner Borneo Olah Sarana Sukses, helicopter transportation services company Jaya Trishindo, solar panel manufacturer Sky Energy Indonesia, trade, transportation and logistics services provider Indah Prakasa Sentosa, telecommunication support services company Gihon Telekomunikasi Indonesia, and chemical manufacturing company Tridomain Performance Materials.